The Kickstarter for EVIL IS A MATTER OF PERSPECTIVE: AN ANTHOLOGY OF ANTAGONISTS, is here and LIVE, staring at you from your electronic device! For those who can hear: you can listen to me read from Without Light or Guide with my Southern accent, and talk about Alvaro, the antagonist/protagonist of my story for Evil is a Matter of Perspective. As of this post, one of my cohorts in evil, Bradley P. Beaulieu, talks about his involvement as well. Keep checking those updates to hear more of your favorite authors talk about the anthology and why they are involved. As a part of the Kickstarter package, I am offering you, that's right YOU, a chance for a Tuckerization in the story! If you choose that level, you will get to pick whose side you are on and fight in the streets of Barcelona during the May Days of 1937. I will give you the power to sing your magic, and if you're really lucky, a most grisly death. The Kickstarter is HERE, the angry cat is HERE, and I hope you'll join us as we explore evil ... it's a matter of perspective. Last week I wrote a blog post on epic fantasy, and in that post, I categorized my work under the term "dark fantasy." I mentioned in a footnote that I dislike the terms "grimdark" and "gritty" in reference to genre literature; therefore I do not use them. I find both of these terms rather meaningless--a notation that my friend and colleague David Annandale noted was a "hand grenade in a footnote." Of course, another friend, whose opinion I respect, disagreed with me. He likes the term grimdark and finds it to be a useful descriptor of novels with darker themes. Rather than justify the terms or even defend the novels, I'm going to tell you why I'm ceasing to use either of these expressions. 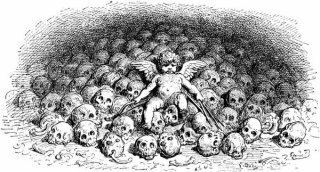 Obligatory cherub on skulls, the official pic of the Grimdark. Click on the picture to Know Your Meme. Aren't we all glad that's over with? Thanks to Steve for sending me the link to the Know Your Meme site. Click the picture to read their version of the history of the term grimdark if you're unfamiliar with it. I doubt you are. Most of us have been exposed to the term in one form or another. My first encounter with the term "gritty" was through a post by Leo Grin regarding what he termed as nihilistic fantasists. He took special umbrage with Joe Abercrombie's work. Grin derided Abercrombie's novels (and to be fair, several other authors) as nihilistic, an accusation that I disagree with, but that is another post for another day. The short analysis is that when balanced against the ultimate nihilistic novel, Grendel, by John Gardner, Abercrombie's work is all unicorns, kittehs, and rainbows. Having read Abercrombie's work, I can attest that Adam Whitehead came closest in his analysis by stating that Abercrombie's work is "gritty, violent, morally ambiguous and darkly funny fantasy with a streak of intelligent cynicism." Whitehead used the word "gritty" as an adjective, which is apropos of the work. He did not use the word to deride (there's that word again) Abercrombie's style. I have a couple of reasons that I'm beginning to avoid the usage of gritty or grimdark to allude to a literary form, and these reasons are simply personal. For a long time, neither gritty nor grimdark bothered me until recently when I've noticed more and more that the terms are used more often as a pejorative indictment rather than as a stylistic descriptor. There is a difference between these two things. You're all literate, I don't need to explain it to you. I don't believe that we, meaning the genre community, need to be involved in condescending critiques over which is better: non-violent or violent fantasy. People are going to read the novels that they enjoy reading, and rather than disparage one form over the other, I think we should be rather grateful that we all can find such a huge variety of work to choose from. The second reason has more to do with the actual meaning of the word. One fine day, I was on Reddit where the discussion had turned to the grimdark and someone noted that Poe and Lovecraft were grimdark. That stopped me. Poe wrote mysteries and horror, Lovecraft wrote horror. Grimdark was becoming a catch-all for anything with a hint of dread in the storyline and, to me, that diluted the meaning of the word. I made a comment in my review of Abercrombie's The Blade Itself that "I couldn’t help but think that if Joseph Wambaugh decided to write fantasy, The Blade Itself is what it would look like." That does not mean that I believe Joseph Wambaugh writes grimdark. I meant that stylistically the two authors exhibit the same penchant for dark humor and sharp prose. Joseph Wambaugh does not write grimdark. That would be like saying that Gillian Flynn writes grimdark novels. Gillian Flynn writes thrillers. Dark and luscious and haunting but thrillers--not grimdark. Going back to the Reddit Poe/Lovecraft comment, I've always considered horror to be more of a psychological literary form whereas grimdark and all of its associations seemed to be more material. Yet as that Reddit conversation illustrates, there are some readers who consider horror grimdark. This does not make these readers bad or wrong or terrible. I simply disagree that grimdark and horror are interchangable. If they were, why bother inventing a new word to encompass an old idea? There are subtle differences between the two styles and while I would love to do a line by line critique, I don't have time for that and time to write the stories and the blog posts and do ALL THE THINGS. Because, time. My point, however, is this: to take a term like grimdark and apply it so universally (to thrillers and horror and any dark novel) tends to rob the word of meaning. I don't consider grimdark to be nihilistic, nor do I find it appropriate to make grimdark a universal tag for all forms of dark fiction. You may disagree and that is certainly fine with me. I think if you enjoy novels with more intrigue than violence, then you shouldn't be shamed for disliking darker fantasies. Likewise, readers and authors who enjoy darker fictions shouldn't be castigated for reading or writing those stories. I once asked my daughter what she thought of a particular novel she was reading at the time. She shrugged and it was very vanilla. I asked her if that was bad and she said no, sometimes she enjoyed a vanilla novel; although, she drew the line at sugar-free vanilla. Which, in turn, made me think of ice cream and tastes. Some of us like vanilla, others need a little more flavor, so it is with our reading preferences--some of us like sweet stories, some of us enjoy the bitterness of dark chocolate. Then I couldn't stop thinking about ice cream and I had to go eat some, but that is another post for another day. Frankly, I'd like to see us, meaning the genre community, do a lot less arguing and be more respectful of one another and our diversity. We'd be an awfully dull lot if we liked all of the same things all of the time. Discussion is good; however, let's try a little harder to disagree without being disagreeable. If you're so inclined, leave a comment and tell me what you consider grimdark and how you define the word. Take the conversation to Facebook, Twitter, or Reddit. I'll be watching to see what you say. As always, I'm interested in your opinion.